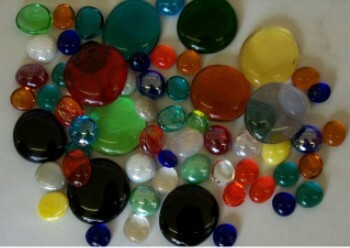 Stained Glass Nugget and Globs are excellent accents to add dimension and texture for stained glass masterpieces. Mix and Match colors and sizes if you like. If you would like a certain number of colors (2, 3, 4, etc. ), select "Specific Colors" and then specify the colors and amount in the Special Instructions section of the ordering process where you enter your name and address. If you would like a certain number of colors (2, 3, 4, etc. ), select "Specific Colors" and then specify the colors in the Special Instructions section of the ordering process where you enter your name and address. Currently out of stock: None. All in Stock! Iridescent Nuggets We still have a variety of colors in iridescents, but we are not able to get these nuggets in anymore. So until they run out we will only be offering mixed colors. Need a Nugget Foiler? Click Here!